The quintet are now happy to announce the upcoming release of their second album Conspiracy on March 8th2019 via their own label Corvid Records. They have also revealed the brand new track "Fleur De Lis", which shares its name with the ancient stylized lily symbol that has long been associated with the heraldry of French royalty as well as linked to unity, loyalty and honor. Listen To "Fleur De Lis" below. 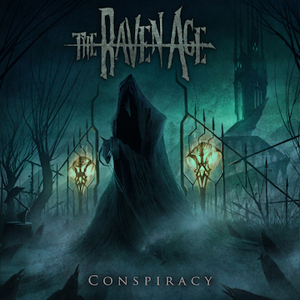 In further news THE RAVEN AGE will be heading out on their biggest headline tour to date in support of Conspiracy. They’ll be playing shows across the UK and Europe – see full dates at the bottom. THE RAVEN AGE released their debut album Darkness Will Rise in 2016. It saw them championed by the likes of Metal Hammer and Planet Rock, who crowned them ‘Best New Band 2017’ at their awards, and earned them slots at festivals such as Bloodstock, Hellfest, Wacken Open Air, Rock Am Ring/Rock Im Park and Download. It then leads into the raging metal riff of the aforementioned "Fleur De Lis" and "The Day The World Stood Still", which enters with a melodious dynamic, creating space between the album’s brutal moments, soaring into a momentous chorus showcasing James’ vocal capabilities. Elsewhere the racing Christian mysticism inspired "Stigmata" is filled with thunderous drum patterns from Jai Patel and heavy bass parts from Matt Cox, while the haunting intro of "Seventh Heaven" explodes into a colossal outbreak of commanding riffs expertly executed by guitarists George Harris and Tony Maue before dropping to a stripped-back section with James’ exposed vocals taking centre stage. Continuing their running theme of historic references, the calmer "The Face That Launched A Thousand Ships" draws inspiration from the legend of Helen of Troy, whose incomparable beauty resulted in a fleet of a thousand ships setting sail to rescue her leading to the Battle of Troy. Similarly, "Tomb of the Unknown Soldier" is named after the US monument which stands in tribute to those exhumed and unidentified from battles over the years. Also included is "Surrogate", the album’s debut track from earlier in 2018, and the sharp and fierce "Scimitar" before the epically sullen, grand finale "Grave of the Fireflies", which resumes the dynamic rise and fall that resonates throughout the whole of Conspiracy.